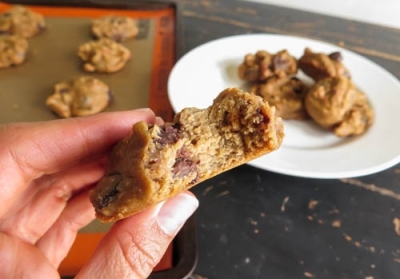 Deliciously addictive chocolate chip peanut butter cookies! Preheat oven to 350 degrees. In a food processor, mix together all ingredients (except pretzels and chocolate chips) until incorporated. Scoop out batter and place into large mixing bowl, fold in pretzels and chocolate chips. Pam spray a baking sheet and drop by spoonfuls. Bake cookies at 350 degrees for 15 minutes. Makes about 16 cookies.